Apologies to those who consider the Elevated Acre their little secret, but after checking it out yesterday it was too great a place to eat lunch to not share. One of my friends tipped me off to this raised park overlooking the water after her office moved way down to the bottom of the island and she was left searching for good places to eat lunch once the weather got warm. Think of it as our very own Highline, minus all of the tourists. 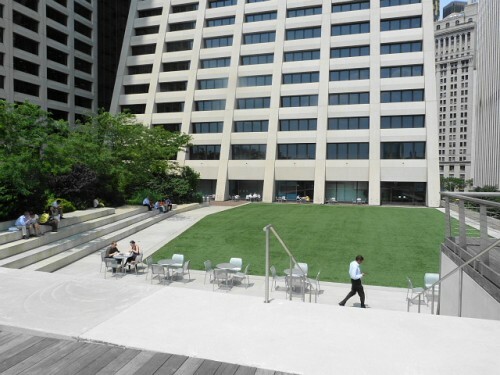 The park is located behind 55 Water St., just past Old Slip. 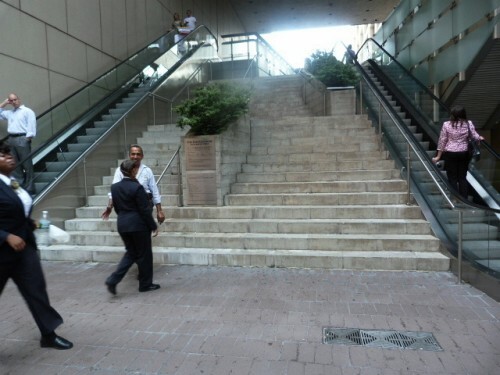 Look for the escalators and set of stairs next to the Chase branch, and then you’ll see a small brass sign noting that Elevated Acre exists, which you would never notice if you weren’t looking for it. After taking two escalators up you’ll be met with a bunch of greenery and so many open benches and tables that make it seem like you’re in a botanic garden instead of slogging through a work day in Lower Manhattan. There aren’t any food vendors up there, but it’s easy enough to grab something from one of the trucks on Old Slip, Coenties Slip or Broad St., or one of the carts at Hanover Sq. It’s a nice change of pace from sitting on a random bench somewhere with traffic and dozens of office workers streaming by, and you can watch helicopters taking off from the helipad below while you eat! 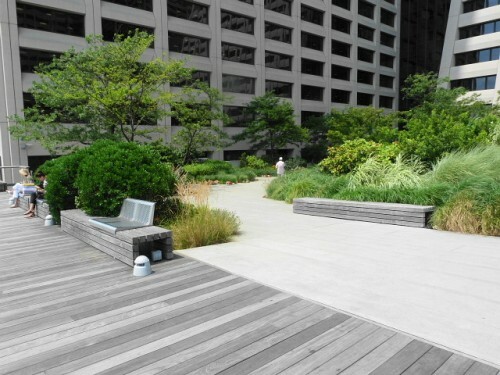 Elevated Acre, behind 55 Water St., between Old Slip & Broad St.
Posted by Andrea H at 9:30 am, July 24th, 2012 under Elevated Acre, Financial District.